Brethren and Companions, this evening we are to have a further two presentations in the series of the Other Orders ‘Beyond the Craft’. First, I would like to welcome John Roberts, who I mentioned earlier is the Provincial Prior of Middlesex for: ‘The United Religious, Military and Masonic Orders of the Temple and of St John of Jerusalem, Palestine, Rhodes and Malta in England and Wales and its Provinces Overseas’, more familiarly known as the Knights Templar and Knights of Malta. So, John, will you kindly give us your 10-minute presentation, and may I remind you that the Provincial GDC, Jim Mitchell, will be on hand to invoke retribution in the form of a guillotine should you exceed this time. Thank you. Second, I would like to welcome Douglas Black, the Grand Superintendent of Middlesex for the: ‘The Holy Royal Arch Knight Templar Priests and Order of Holy Wisdom’, which is governed by the Grand College of England based in the City of York. So, Douglas, please will you now likewise give us your 10-minute presentation, and the same rules apply! Thank you. Well, Brethren and Companions, I hope you found these two presentations to be of interest and, on your behalf, I would like to thank John and Douglas for taking the time and effort to prepare and make these presentations to the members of the PGO Club. I suggest, if you require any further information or have any questions you may wish to ask, that you speak with either or both of them after the end of this meeting. Now this is the part of this evening’s programme where it says that: “The President … … will address the Members of the PGO Club” and turning to Provincial matters, this where I am told that I am supposed to make ‘a state of the nation’ address, so here goes. Mike is well known to all of you including, amongst other things, as the former Provincial Grand Orator, the Organiser of our Annual Provincial Services of Thanksgiving at either Guildford or St Alban’s Cathedrals and, currently, he is this year’s Prestonian Lecturer with his lecture entitled ‘Freemasonry and the Great War’, which has just been published by Lewis Masonic at a cost of £10, so please buy a copy. He is, of course, the current 3rd Provincial Grand principal in the Royal Arch. Also in the Royal Arch, I know that, like me, you were all greatly saddened to learn of the untimely death of the 2nd ProvGPrin, E. Comp. John Culling PAGDC, who passed away just four weeks ago on 11 March 2019, having been diagnosed with advanced pancreatic and liver cancer only a very short time beforehand. JC was literally a larger than life character, who loved the Royal Arch, and will be sadly missed by us all. However, he was due to retire as 2nd ProvGPrin in July this year when he would have completed five years in that office and having discussed his potential successor with him before he died, he expressed his delight when he knew that I was going to appoint E. Comp. John Eynon, PGStB Designate, to succeed him. As Grand Superintendent, I shall have the privilege of obligating, investing and installing John Eynon as the 2nd ProvGPrin at the Annual Meeting of Provincial Grand Chapter at The Twickenham Stoop, Harlequin FC on Tuesday 9 July 2019 and I am sure that you will join me in expressing congratulations to John on his forthcoming appointment and wish him every success in his new role in the Province. I hope that you will make every effort to attend the Annual Convocation in July to support him. I had hoped to be able to announce the name of the Brother to fill the current vacancy as an Assistant Provincial Grand Master, but as I have not yet received confirmation of his appointment from the Provincial Grand Master, I am unable to do so, but I hope to be in a position to announce his appointment shortly via the Provincial website, so the Bookies are still taking bets and the odds are looking good! When I can make the announcement, this will bring both the Craft and Royal Arch Executive Committees back up to full strength again and I do not envisage any further changes in either Executives in the foreseeable future. However, there has also been a recent change in the chairmanship of the Provincial Communications Committee with W. Bro. David Allan PSGD, PAProvGM taking over from W. Bro. Nigel Codron PSGD, PAProvGM. Union Canal finishing at the Bury Lake Young Mariners HQ at Rickmansworth Aquadrome where a BBQ will be held. •	In addition, the Annual Service of Thanksgiving will be held at Guildford Cathedral on Sunday 27 October. 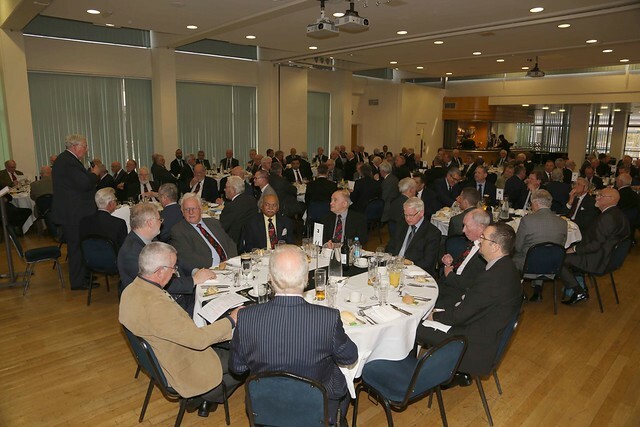 Details of all Provincial events can be found on the Provincial website and I encourage you to take time to look them up online, as many are intended to be social occasions to include your families, friends and non-Masons, so please do support them if possible. Membership remains THE biggest concern facing Freemasonry in general and the Province of Middlesex in particular, and it is at the forefront of the minds of the two Executive Committees and it should also be of concern to all of you in terms of the future viability of your Lodges and Chapters and, of course, the Centres where they meet. Both Grand Lodge and Grand Chapter are trying hard to address the membership problem, as are the two Provincial Executives, so here are so of the things we are currently trying to do to recruit, retain and rejuvenate membership. In order to attract potential Initiates, the Provincial Communications Committee has been running a series of Discover Freemasonry in Middlesex seminars at some of our Masonic centres, targeting potential members locally via social media (Facebook). Since last September, three seminars have been held at Twickenham, Harrow and Uxbridge and a further four seminars are planned for later this year meaning that all five Centres will have been covered. This has created some interest, with potential candidates being followed up by interviews at each centre, although the conversion rate to actual candidates has so far been quite low, but it is getting Freemasonry ‘onto the agenda’ in the minds of a section of the uninformed general public, including the ladies. We need to capitalise on this initiative and increase the conversion rate into actual new members. We are also participating in the Universities Scheme, which Ruislip St Martins Lodge joined about two years ago, in order to try and attract younger members, particularly linking up with Brunel University. So far, they have initiated 6 candidates with another 2 in abeyance and Barn Hill Lodge’s application to join the University Scheme to link up with Middlesex University has recently been accepted, so watch this space. We are also reviewing the 3Rs booklet to try and assist Lodges with advice and guidance regarding Recruitment, Retention and Rejuvenation, but the Executive can only provide the tools and motivation and it is down to you and your individual Lodges to try and attract suitable new members to the Craft. In the Royal Arch, we have recently reviewed and re-issued the Guidance Notes for the Royal Arch Representatives in Craft Lodges together with the Candidates Guide to the Royal Arch, and it is imperative that Lodges appoint the appropriate member of the Lodge with the right skills set to aid recruitment to the Royal Arch and also allow them an opportunity, at least once annually, to say something about the Royal Arch in open Lodge. I reiterate what I said here last November, that Brethren have not completed their Masonic journey in Pure Antient Masonry until they have joined the Royal Arch, and in my view it is important that should be the next step in their Masonic career after becoming a fully-fledged Master Mason, otherwise the are left in limbo with the genuine secrets of a Master Mason having been lost. I know that I am most likely preaching to the converted here, but it is important that we encourage those Master Masons in our Lodges to undertake this next and most important step in their Masonic career. Also, to make the Ceremony of Exaltation more interesting and increase an understating of the Ritual, The Soujourners’ Readings are being reprinted and copies will be distributed to each Chapter shortly. The purpose of these readings is to give a brief introduction and explanation to the various parts of the Ceremony so that candidates can better appreciate the Masonic experience through which they are about to pass. They are designed to be read, usually by the Principal or one of the Assistant Sojourners, before each of the three entrances into the Chapter during the Ceremony, either outside the door or, preferably in my view, just inside the entrance to the Chapter so that they can be heard by all the Companions. At last autumn’s PGO Club meeting, I mentioned that we were developing a presentation entitled: A Dialogue with the Royal Arch to be given in Craft Lodges, perhaps when no ceremony or other work is planned. The draft presentation was delivered to the Royal Arch Executive Committee at the beginning of March and following constructive comments necessitating some refinement, it is now ready for launching. Two pilot presentations are planned at Edgware Lodge No. 3866 at Harrow on Thursday 23 May 2019 and at Ickenham Lodge No. 5770 at Twickenham on Saturday 22 June 2019. Thereafter, and subject to any feedback from these two pilots, the presentation will be generally available to Lodges from 1 September 2019. Bookings will need to be made via the Provincial office. If you may wish to attend one of these two ‘pilot’ meetings, then I suggest you either contact the relevant Lodge Secretary from the details in the Middlesex Yearbook, or via the Provincial Office. I have previously announced that 2020 will be a very important year for the Province as we will celebrate not only the 150th Anniversary of the foundation of the Province of Middlesex, which was inaugurated at the Clarence Hotel in Teddington, on 22 January 1870, but also the culmination of almost 5-years of fund-raising for The 2020 Festival in aid of the Royal Masonic Trust for Girls and Boys. I am delighted and very proud to announce this evening that, through your tremendous generosity, we have reached another milestone in our fund-raising with a current total of £3.8m, a tantalising £200k short of the next significant milestone of £4m, which was the final total we managed to achieve for The 2009 Festival for the RMBI, albeit with a greater number of members in our Lodges and Chapters at that time. There is still about 11 months to go before we reach the end of The 2020 Festival and I urge you to empty your Relief Chests and redouble your efforts in these last few months so that we can achieve a truly magnificent final total for the work of the RMTGB and, indeed, one to make our Provincial Grand Master extremely proud of us. When I had an audience with HRH at Kensington Palace in February, I was able to tell him we had then reached a total of £3.72m and he commented on “the extraordinary generosity of the Members of my Province”. So, please remember the Festival slogan that: ‘A Man Never Stands So Tall As When He Kneels To Help A Child’ and let us all make the final push for The 2020 Festival in these last few months and achieve a final total of which both our Provincial Grand Master and all of us can be justly proud. Perhaps somewhat foolishly, I have agreed that the Craft and Royal Provincial Executives will conduct a ceremony during 2020 at one Lodge and one Chapter to be chosen from a Relief Chest Draw. The Rules for an entry into the Draw are simple. For every £1,000 transferred by a Lodge, or £500 by a Chapter, from its Relief Chest to The 2020 Festival you will be entitled to one entry into the Draw. Historical transfers prior to the launch of the Draw on 1 January 2018 will still be counted, so long as at least one entry/transfer has been made since the launch date. I know I have mentioned this before, but I am afraid that the message still does not seem to get through to all Lodge and Chapter Charity Stewards, that funds in Relief Chests have been given by your members for charitable purposes and are NOT meant to sit festering in a bank account, so please make a nuisance of yourselves and politely ask your Charity Steward how much is in your Lodge or Chapter Relief Chest and, if you find that there is a significant balance residing there, then please persuade both him and your fellow Members to transfer the money to The 2020 Festival and let the RMTGB make use of those much needed funds today. Thank you. Still on the charitable theme, I would like to mention the Orangery Project at Prince Michael of Kent Court, which is one of the RMBI Care Company Homes located in Watford, so named after our Provincial Grand Master who originally opened the Home almost 25 years ago in July 1994. At that time the Home was designed to cater for about 75% ordinary care and 25% dementia care patients, primarily from the Bedfordshire, Hertfordshire, London, Middlesex and adjacent areas – there are currently about 6 Middlesex residents living there. With increasing life expectancy the ratio is now about 50/50 for each type of ordinary and dementia care and in 2018 the Association of Friends of PMK Court embarked on a fund-raising exercise to raise £100,000 for the construction of the Orangery Project to provide residents with dementia care needs, a calm and relaxed space to use during the daytime. Shortly after my installation as your Pro Provincial Grand Master and Grand Superintendent last July, and during a meeting with one of the Deputy Metropolitan Grand Masters, who is a good colleague and friend of mine, I was gently chided by him for the fact that Middlesex had not, apparently, at that time donated much if anything to the Orangery Project. Knowing nothing about it I made further enquiries and then approached the Trustees of the Middlesex Masonic Charity, the Middlesex Province Relief Fund and the Middlesex Mark Benevolent Fund – HRH is also the MW Grand Master of the Mark Degree – and asked each of them if they would each consider making a donation towards the Orangery Project. I am delighted to say that they all responded speedily and positively and together with other funds raised from a recent Sunday lunch organised at Uxbridge and donations by Prince Michael of Kent Lodge and Chapter, Middlesex has now donated almost £35,000 towards the Project, which is a magnificent contribution at a time when we are already ‘in Festival mode’, so I would like to express my thanks to all of them for their positive response. Construction of the Orangery is well under way and completion is expected either in late May or early June and it is hoped that HRH will visit the Home later in the summer or early autumn to formerly open the extension. This is in addition to the Masonic Garden that Middlesex entered in the Royal Horticultural Society’s Hampton Court Flower Show in 2007, which was subsequently dismantled, transported and re-assembled at the Home after the end of the Show for the benefit of the residents of PMK Court. I am aware that some of our Middlesex Lodges, Chapters and individual Freemasons and their families already support the Home, but if you wish to know more about either the Home itself, or the Association of Friends of PMK Court, then please look at their respective websites – Mr Google will assist you in finding them! There are Lodge Open Days planned at PMK Court for Sundays 14 April and 15 September 2019 and the Middlesex Masonic Choir will be singing Festive carols and songs to the residents on the afternoon of Sunday 1 December 2019, should you wish to join in and attend. In conclusion, I hope that you have enjoyed our meeting and dinner this evening as well as the companionship of your Fellow Masons and, of course, the two ‘Beyond the Craft’ presentations given by John Roberts and Douglas Black. On your behalf I would again like to express thanks to them for spending the time and effort to put the presentations together for our information and enjoyment. I would also like to express my sincere thanks to Gary Collins, the Secretary of the PGO Club, for making all the necessary arrangements for this evening’s dinner and meeting on your behalf and of course our Treasurer, Warren Gell, looking after our finances so capably. Finally, Brethren and Companions, thank you all for attending this meeting of the PGO Club and for so patiently listening to my Address. Please have a safe journey home and I shall look forward to seeing you around the Province in due course and may God bless you, your families and loved ones as we approach the most important season of Easter. Thank you.